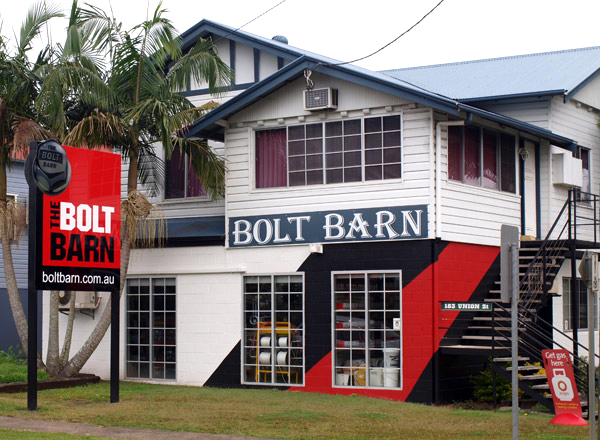 BOLT BARN is a independent family owned company that has been in Lismore , Northern New South Wales for twenty four years. Although Bolts are our business we are renowned for having just about anything you need when it comes to bolts, fasteners and equipment. We service a wide variety of customers from anything like heavy industry, farming and the DIY handyman just to name a few. We have long term, experienced staff who have seen just about every project there is to advise you on the best product for the job. Quality is important to us and we have a vast and complete range of quality bolts and fasteners in all shapes and sizes and the best part is we will sell you what you want. If you want one or a 1000 we can supply it to you, no worries. We also stock a great range of hardware and equipment that goes hand in hand with the bolts and fasteners industry, also a lot of odds and ends left over from other projects so you never know what we have got until you ask, we will send products anywhere you like. If you need something a bit odd chances are we will have it or because we have been doing this a while we may know where to get it. BOLT BARN also specializes in Bulk orders for those products you use a lot of. Basically the more you buy the cheaper the rate gets. Contact us for a quote and you will see how competitive we can be.